How much does it cost to travel to Cebu? How much money will you need in Cebu? ₱2,963 ($57) is the average daily price for traveling in Cebu. The average price of food for one day is ₱961 ($19). The average price of a hotel for a couple is ₱2,324 ($45). Additional pricing is in the table below. These average travel prices have been collected from other travelers to help you plan your own travel budget. Cebu Island is an important island in the Visayas region of the Philippines, characterized by its main port at Cebu City as well as many natural features. The most-visited areas include islands of Mactan, Bantayan, Badian, Malapascua and Camotes, all which have resorts and hotels. Scuba diving and snorkeling are common activities along the shoreline, while hiking the mountainous spine of the island is popular inland. 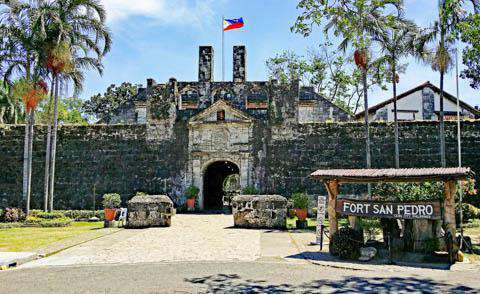 Cebu has plenty to see and do both within and outside the island's main city. Exploring Cebu City, visitors will come across a number of historical landmarks, shrines, and other monuments like the Basilica of Santo Niñoa Catholic church where a statue of the baby Jesus is enshrined. This statue (the Santo Niño) was a gift given by the Portuguese explorer Magellan to Raja Humabon upon Magellan's and the Spanish explorers' arrival in March 1521. Additional sights in the city include the The Mactan Shrine (to a local chieftain, Lapu Lapu), the Casa Gorodo (former residence of the provincial governor of Cebu), Fort San Pedro (the first, oldest, and smallest Spanish fort in the Philippines), and Magellan's Cross (in commemoration of the Portuguese conquistador who introduced Christianity). Beyond Cebu City, there are plenty of stunning locations amidst beaches, mountains, and waterfalls. Bantayan Island, for example, has beautiful white sand beaches, while Osmeña Peak provides a popular hiking destination. Most hikers will begin in Dalaguete town in the south and can continue to traverse the island to Kawasan Falls in Badian. Mactan Island is home to a number of resorts and hotels, while Malapascua Island offers scuba diving, thresher shark watching, and uncrowded white sand beaches. Other nearby attractions include the Olango Island Wildlife Sanctuary and the Camotes Islands, featuring a number of beaches, natural pools, waterfalls, and a lake. Cebu city is one of the most popular destinations in the Philippines for foreign visitors. In addition to being a booming metropolitan area, the city is also known for its white sand beaches and historical landmarks which reflect its past as a major port. Other cities include Danao City, Bogo, Lapu Lapu, Mandaue, Toledo, Car Car, and Alegria. Moalboal is another common place to visit, mostly as a basecamp for the surrounding area which provides great opportunities for diving and snorkeling. In addition to its proximity to a coastline of reefs and Panagsama beach, Moalboal is also near natural wonders in the mountains with scenic vistas and dense tropical rain forests divided by rivers and canyons. From beach and mountain scenery to historical landmarks, Cebu is an island with plenty of opportunities for sight-seeing. In addition to these features, many come to the island to kick back at a resort or get active with watersports like scuba diving, snorkeling, kiteboarding, and windsurfing. Mactan and the surrounding smaller islands are hubs for scuba with over 20 dive sites in the general area. Kontiki reef is one particular site that is considered to be the best scuba training area for recreational scuba diving certification. As far as food goes, Cebu city will have just about anything from tasty local street food to international flavors like Chinese, Japanese, Korean, Italian, American, Spanish, Thai, and Indianyou name it. For tourists, the two best areas to find dining options are Ayala Mall and IT Park. The Ayala Center in Cebu has an extension (adjacent to Marriott Hotel) called The Terraces with an abundance of food choices. It also has two grocery stores with large sections of food imported from all around the world. The IT Park, on the other hand, has over 20 restaurants with most of them open 24 hours a day. Both of these eating areas offer plenty of options as well as free Wi-Fi. The city is served mainly by Mactan-Cebu International Airport with most flights coming from Manila on one of two major national airlines, Cebu Pacific and Philippine Airlines. Cebu Pacific and Philippine Air also have direct flights from Korea as does Asiana Airlines. There are flights from Singapore with Silk Air and TigerAirways, from Hong Kong with Cathay Pacific or Cebu Pacific, and from Doha with Qatar Airways directly to Mactan-Cebu International. The airport is located on a separate island (Mactan), and it takes about 20-30 minutes to get to the actual city of Cebu. Taking a taxi is the best way to reach the city from the airport.